Libby telling Mike she's been given a rotten job as a gossip columist for the Erinsborough News. Bill invites Anne over for dinner. Anne showering Bill with champagne. Bill takes off his soaked shirt and chases Anne around the room. They fall on some cushions and start kissing. Susan comes in at that moment to find Bill on top of Anne. Susan says sarcastically, “Dinner went well, then”(!). Bill tells Susan that nothing is going on and Anne backs him up. Susan makes sarcastic comments. Bill and Anne say they'll clean up the mess. Bill asks where Karl is – apparently he broke down a couple of blocks away. Susan is still making Bill squirm with comments such as on her dinner, the drink went into the glasses as opposed to over their clothes(!). Lib doesn't know whether to take the gossip column job or not. Mike says it might be better than she realises. Mike tells Libby that Geri is going to do the job following Mike at the Erinsborough News – she was the only one who put in for it. He says he's putting Libby in charge of making sure she doesn't screw up. Mike is looking at negatives. Libby comes in and tells him that the gossip column is a permanent position, albeit part-time. Mike obviously knew in advance. She's now a D-grade journalist! Geri comes in and gushes at Mike. She and Libby greet each other coolly. She downplays Libby's column and says she doesn't want any help from her. They are obviously enemies from the start! Susan is reading one of her classic novels. Toadie comes in and asks about getting Tad into Erinsborough High. He says they won't have any trouble out of him – Tad is the quiet and sensitive type(!). Susan says she hopes so as the education system is still shell-shocked from Toadie's passage through it! Anne and Lance are waiting for their results. They are going outside to wait on the lawn in deckchairs. Bill, Anne and Lance are waiting for their results. They mob the postman when he arrives. They open then all together. Anne gets very excited screaming that she's passed. Bill hasn't opened his – he wants to open it with his mum. Lance says he didn't do too well. But Anne says he was ill all the way through and it will be enough for him to do horticulture. Phil congratulates Anne and Lance. Anne brings in a letter for Phil – he's been called for jury duty. Amy comes in, excited – she has passed too. Lance kisses her on the lips and there is an awkward silence. Anne breaks the silence by bouncing around. Bill and Susan are opening his results. They are speechless – he has done really well, better than he expected. He and Susan jump around. Amy, Anne and Lance come in and get excited at Bill's results too. When they've gone, Susan calls Bill her “little genius” and hugs him so tightly he's almost strangled! Toadie gives Phil some invoices. Phil tells Toadie that he's been called for jury service. Toadie says he's always wanted to be on a jury himself. Then Toadie opens a box to find it has been gnawed through. Toadie thinks it must have happened in the warehouse – the pub is a rat-free zone while he's in charge. Victoria (Mike's wife) brings in her car. There is steam pouring from under the bonnet. She says Mike will let her borrow his car, and also makes a crack about Mike having the “young girl”. Drew isn't too amused though. Bill and Amy are ordering a bottle of champagne for a celebratory picnic. Toadie says he wants to do something in the pub while Lou's away. Amy suggests a DJ, so Toadie calls his mate for ideas. Geri and Libby are sniping at each other. Geri tells her she should do a story on lecturers getting off with students! Toadie has managed to book a band for the pub. Bill reckons he should run it by Lou, but Toadie says Lou put him in charge. Bill sees some little brown pellets in the peanut bowl – rat dung. Amy runs off to be sick! Libby tells Mike what she's putting in her first gossip column. He tells her to check her desk drawer. 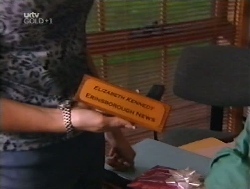 In it is a present from Mike – a plaque for Libby's desk with “Elizabeth Kennedy, Erinsborough News” on it. When he's gone, Geri mocks Libby's plaque. But Libby says having a real job is great and Geri should try it some time(!). Amy is back from being sick. Toadie says that the rat must be inside the pub. Bill says Toadie had better find the rat quick. Toadie gives Amy a packet of peanuts to make up for thing. She says she can't be bought off with peanuts! But Bill says that he can(!) and takes the peanuts for the picnic. Drew comes in and says someone is interested in buying the Thunderbird. Susan gets very excited and tells Drew she'll make sure that Karl doesn't haggle! Drew asks her if the police have found the idol. Susan says not – and it's not knowing what happened to it that's so hard(!). Mike is looking for Libby – she's gone into the archives though. He asks Geri to tell Libby that he's taking Victoria and Sasha to see Sasha's great-grandmother. Of course, Geri just tells Libby that Mike has “gone off with his wife”. Libby runs out and sees them leaving.